There is ‘San Andreas‘ sequel coming from Dwayne Johnson and New Line with writers Neil Widener (‘Subdivision, Colorado‘) and Gavin James (‘Footsteps‘) tapped as the creative team to write the screenplay featuring a return to the quake zone. The pair of writers sold ‘Verona‘, a reimagining of William Shakespeare’s ‘Romeo and Juliet‘ with Joe Roth producing. They’ve also set up the true-story drama ‘Battle for Alcatraz‘ at Paramount with ‘Bridge of Spies‘ alum Matt Charman producing. Johnson is not the only one excited about the return, a big chunk of the original team is returning for the sequel with him, among them, director Brad Peyton and producer Beau Flynn. 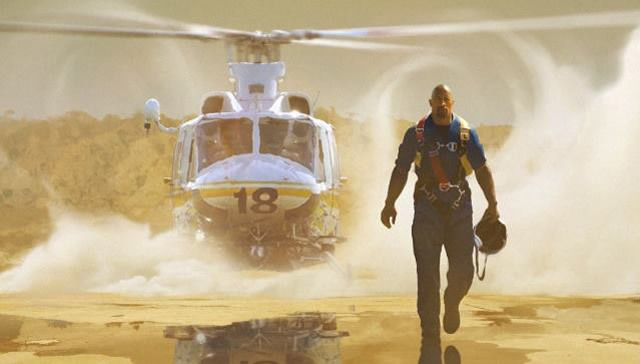 ‘San Andreas‘ featured Johnson as a search-and-rescue helicopter pilot who teams up with his estranged wife played by Carla Gugino to save their daughter (Alexandra Daddario) when a series of quakes crush Los Angeles and San Francisco. All are returning along with Paul Giamatti, who played a seismologist. While we don’t have many details for the new film, we do know it’s expanding the disaster locales by going global, focusing on the infamous Ring of Fire. The ring circles the Pacific Ocean with fault lines and volcanoes and, according to scientists, is home to about 90 percent of the world’s earthquakes. This entry was posted on Friday, February 19th, 2016 at 1:48 pm	and is filed under Film, News. You can follow any responses to this entry through the RSS 2.0 feed. You can skip to the end and leave a response. Pinging is currently not allowed. « HBO Renews ‘Vinyl’ For A Second Season!! !